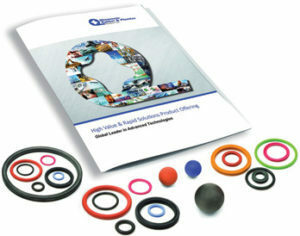 Minnesota Rubber and Plastics offers a large inventory of standard size, molded, Quad® products including O-rings, Quad-Ring® and rubber balls. O-ring seals serve as a general-purpose seal for use as static, reciprocal and oscillating seals in low-speed and low-pressure applications. Quad-ring lobed seals reduce friction and eliminate leakage with strategically placed parting lines. Both are available in 12 different materials in outside diameter sizes from 0.070 inch (±0.003) to 0.139 inch (±0.004). Quad rubber balls are molded of 70 Shore A nitrile compound and are available in 14 diameters from 3/32 inch (0.093 ±0.003 dia., 0.003 sph) to 1.0 inch (1.000 ±0.004 dia., 0.005 sph).